Product prices and availability are accurate as of 2019-04-18 22:18:20 UTC and are subject to change. Any price and availability information displayed on http://www.amazon.com/ at the time of purchase will apply to the purchase of this product. These small Pyrometric Cones are used on a shelf inside a kiln or in a kiln sitter to determine when a firing is complete, if the kiln provided enough heat or if there was a problem during the firing. 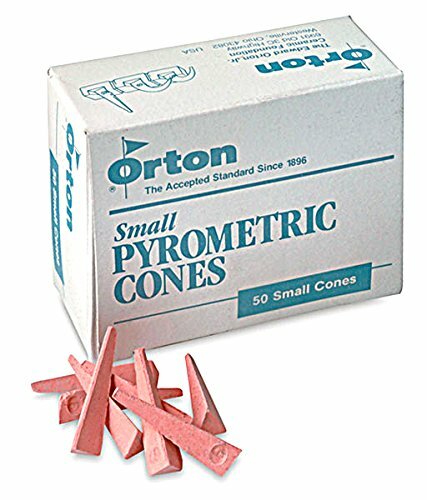 These Orton cones are made from carefully controlled compositions so that they bend in a repeatable manner over a very small temperature range. When used in a cone holder the cone tip reaches a point level with the base indicating it is properly fired. The cones can also be used in a kiln sitter with equally accurate results. Cones have been used in ceramic firings for more than 100 years and Orton has the history and experience to provide the very best product. This offer includes one box of 50 cones. The number of this cone is 04 which bends at an approximate temperature of 2008 degrees Fahrenheit depending on firing conditions.